Since there have been some updates to My Support Portal, I have gone through and updated the steps on how to open a Support Request (SR). Video to come in the future. This will open up your My Support Portal. If you have multiple accounts connected to your My Support Portal, make sure you choose the correct one in the drop down on the top right using the drop-down arrow. Now that you’re logged into your account that you want to open a Support Request in, let’s go over what you see. First, you can choose to view Support Requests or Dashboard. By default, you are brought to Support Requests. Click the Filter icon to filter by what you have entered in the fields. Click the Refresh icon to clear the filtering fields. The subsequent information requested in the form changes based on which Request Type and the Symptom you choose. Any field that has an asterisk by it is required. Click the question mark icon if you would like more information for the noted fields. Fill out all the information as best as you can. Under Severity, you have 4 choices. They range from Severity 1 through Severity 4. If you feel that you have a Severity Level of 1 (your production system is down or inaccessible), please call Global Client Support instead of entering a Support Request. If you wish to include others on your Support Request, you may enter their email address (one per row) under Other Interested Parties by clicking the + icon. Based on the symptom you chose at the top, you may be required to upload files under the Upload Files section. Please use the available tools for larger file types. For more information, click the question mark icon. To add additional files, you can click the + icon under the required items. When you have filled everything out to the best of your knowledge, simply click the Submit button. And that’s it! If you have any questions, please don’t hesitate to ask! I'm hoping you can help me and that i'm submitting this in the right place. I have trouble with the "Downloading the exercise system" part where i have downloaded both WMware and Virtualbox and imported the Pega software in to them. When i start the Pega Fundementals i WM machines i get the URL but it dosen't work. Ig et a "description The requested resource is not available." error. I have checked the network settings several times and they are configured correctly. At this time i dont know what else to do. Please help! This looks like an issue with Pega Academy so I have branched your reply into this new post on the Pega Academy community: Trouble with the "Downloading the exercise system"
Please update the new post to continue troubleshooting! Lochana | Community Moderator | Pegasystems Inc.
You must be affiliated with a Pega Account. You must be an Authorized Account Contact. As mentioned in the introduction to the video, for more information, see the customer handbook, Support @ Pega. Find this handbook on the PDN menu: Support > Product Support. On the Product Support page, scroll to the list of Resources. The above post gives you instructions on creating a Support Request. Please follow the instructions above to create an SR. I need some help in updating my pdn support profile. Whenever I raise a new SR, it is raised under a previous client I worked for. How can I change it ? Send an email message to support@accounts.pega.com. Business Analyst Portal: Specification Explorer: No Scrollbar? 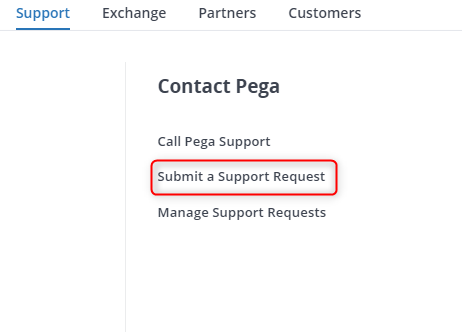 How to change the following wording on the Case Manager Portal: "Pega Case Manager"? 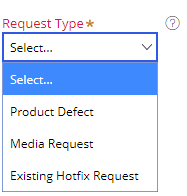 Why can't I raise a support request, I am not able to see create option in the portal?